Qatar International Food Festival is all about the food with approximately 178 vendors taking part for QIFF2018! This year there will be a variety of hotels, restaurants, cafes, eateries and coffee vendors taking part. Entrance to Qatar’s annual food festival is free; while food from vendors has been priced from 5 to 40 QAR. 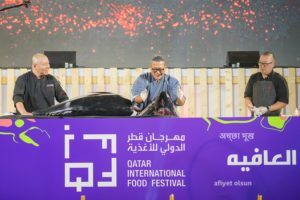 QIFF2018 will be the biggest food festival organised in Qatar, with plenty of food offerings from old favourites and new startups. Don’t forget to check out our main QIFF feature where you can learn all about the different activities and attractions on offer. We also have a great feature about all the FREE things to do at QIFF2018 for the family! For all the details about the chef demonstrations visit QIFF2018: Live Cooking Theatre Schedule. Please note: All efforts have been taken to ensure that the following information is accurate. The list of vendors is not complete – but we will be updating regularly! We have provided some details about the food booths and their offerings, but we haven’t been able to visit all the food booths to give our personal opinions. Also be aware that food vendors may change their menus and pricing at anytime during the food festival. We have done our best to ensure that the information included here is accurate and useful to our readers and visitors to #QIFF2018. The official festival timings are as above, however individual food vendors may have their own timings. There are mobile ATMS at the festival, but we suggest you make sure you take money with you so you avoid having to queue at busy times. Be aware that some vendors only accept cash. If you have any comments please use our Contact page, or send us a message on our social media pages. Don’t forget to share the feature if you found it useful! 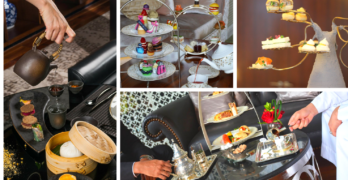 W Doha has a selection of W’s favourites including Thai Beef Burger (QAR25), and the Japanese Cheesecake (QAR15). Prices range from 15-25 for main items. Sheraton Grand is offering their famous Umm Ali (QAR20) at the festival. Say hi to Chef Ahmed El Shahat while you are there! Four Seasons Hotel has three different menus planned throughout the 11-day festival, first focusing on menu items priced from QAR 20-25 for main dishes. Expect Elements restaurant (15-18th March), then The Pier (19th-21st March), and finally Nobu Doha (22nd-25th March)! Sharq Village & Spa has a changing menu of American street food dishes created by Executive Chef Dwayne Krisko. Prices are set at QAR25 for main items. InterContinental Doha The City is bringing back the flavours of Asia from their Hwang restaurant with items such as Kung Pan Chicken, and Chicken Siew Mai. Prices range from 15-30 for main items. Doha Marriott is showcasing items from their Indian Restaurant Taj Rasoi including Chicken Biryani (QAR30), and Gulab Jamun (QAR15). Kempinski have gone street food, with their signature Camel Burger (QAR35), and Bao Buns with braised ribs (QAR35). Prices range from 30-35 for main items. 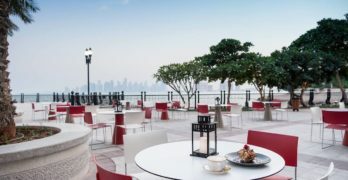 DoubleTree by Hilton – offering a selection from across their F&B venues including dishes from their new opening Claw BBQ such as Buffalo Shrimps (QAR30). Prices range from 20-30 for main items. Westin Doha has a variety of food offerings from its Sabai Thai restaurant, with Papaya Salad (QAR25), and Green Curry Chicken (QAR30). They have their famous mango sticky rice (QAR30) too! Ritz-Carlton Doha has a very small menu for QIFF2018 with Chicken Tacos (QAR30) and Pasta with Wild Mushroom Sauce (QAR30). Fraser Suites West Bay has a limited menu at their booth that includes Fried Mac n Cheese Balls (QAR 25) and Thai Rolled Ice Cream (QAR25). Prices range from 20-30 for main items. Water = 2 QAR! The St. Regis Doha is highlighting their London Twist menu with Wagyu Beef Burger (QAR35), and Fish & Chips (QAR30). They’re also offering two kids meal combos priced at QAR25 each. Prices range from 25-35 for main items. Holiday Villa Hotel & Residences has a range of Far East specialities including Peking Duck Dumplings (QAR20), and Nasi Lemak with Beef (QAR30). They also have Pandan-flavoured desserts! Prices range from 20-35 for main items. Ramada Encore has gone with a shabby chic garden party concept at their booth, with most mains priced at QAR15 including sushi and shrimp tempura. They also have fresh falafel at QAR5. Water = 2 QAR! 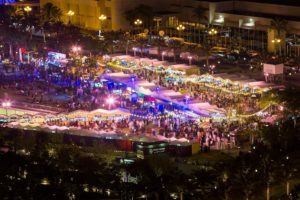 Restaurants, Cafes & Food Trucks at QIFF! As usual there will be a special Health Zone, while the new addition this year is the coffee zone which highlights the new trend of 2018. There will also be 6 food trucks at QIFF2018. Baan Thai Restaurant has a variety of Thai specialities on their QIFF menu, including Pad Thai (QAR20), and Satay (QAR10). Prices range from 20-25 for main items. Kakori House has a range of Kebabs and Biryanis on offer at QIFF2018, with Main Menu items priced from QAR 15-22. Water = 2 QAR! Aryaas Express has popular Indian street food including dosas! Nando’s Prices range from 20-30 for main items at this popular South African brand. Zaffran Cafe is a favourite at QIFF with it’s famous Indian street food dishes including Bhel Puri (QAR12), Vada Paav (QAR6), and Pani Puri (QAR6). They’re also offering their Smoky Biscuit (QAR5) again – a custard cream biscuit dipped in dry ice for a ‘dragon-breath’ treat. Prices range from 6-30 for main items. Ohannes Restaurant has a selection of Middle Eastern menu items including Shish Taouk Sandwich (QAR10), and Warak Enab (QAR5). Main menu items are priced from QAR 5-15. De Lord Cafe/L’incontro is offering a selection of salads, pasta and crepes. They also have lobster thermidor on the menu! Viva Mexico/Mr Taco is a popular Mexican street food restaurant offering tacos and burritos – not to be missed! Tawabel is a local eatery located in Financial Square. They have a wide selection of items for QIFF including salads, mains, and desserts. Prices range from 25-40 for main items. Tandoor is offering a Tandoor Bowlz concept including Khemma Masala rice bowl (QAR18). Main menu item prices range from QAR 15-20. WE Cafe (local brand whose chefs will also cook at QIFF live cooking theatre). Mankousha Wa Falafel has a variety of Middle Eastern street food snacks including Manakoushat Zaatar (QAR6), Lamb Sandwich (QAR12), and Roasted Chicken with Rice (QAR15). Main Menu items are priced from QAR 10-15. Water = 2 QAR! Fajies has fresh home baked treats with items such as doughnuts, truffles, and cake balls. Main Menu items are priced from QAR 20-35. Poffy’s Mini Pancakes has mini pancakes specials they have developed just for QIFF2018 including Kinder stuffed pancakes. (QAR30) Prices range from 25-35. Anneli Turkish Cuisine has Turkish baked goods including pide and simit. Turkish Coffee available too. Madeleine Patisserie has a selection of sweet treats including a chocolate fountain, and super hero cake pops. Fries Code is the new french fries only food outlet, but they focus on gourmet toppings with topping options that include Wasabi Avocado, Dynamite Pickles, and Raspberry Ranch. Prices range from QAR 15-30. Soft Loop offers very Instagram-friendly churros (QAR20) and ice-cream (QAR20) treats. Hamssah w Aiesh is a local Instagram-based business with homestyle dishes including Chicken & Rice, and Kebab Roll. Prices range from 35-40 for main items. RAW Me is always a QIFF favourite. Offering a wide range of healthy options including mains, sandwiches, and cold-pressed juices. Menu items include Acai Bowl, Kale Chips, Sugar Cane Juice, and raw Ice cream Sandwiches! Prices range from 20-40 for main items. Excellent Booth Design! Water = 2 QAR! Evergreen Organics celebrates all things Vegan, and has created a special mini Boss Burger (QAR40) especially for QIFF2018. Other menu items include the fresh coconut drink (QAR35), and vegan cheese platter (QAR40). Healthynoorfood by Noor Al Mazroei is a local home Instagram-based business, with healthy dishes on its menu with gluten-free and vegetarian options. Coffee and You is a new local artisan coffee brand, with drink prices ranging from 20-35. Pinna is a new cafe concept that will open soon in Westbay. At QIFF they have some cute cafe art with their coffee characters Tiny, Cutie and Smartie. If you’re looking for a unique Instagramable coffee this is the place. Drinks prices 20-35. Le Petit Camion Coffee is a vintage Truck with coffee at its heart. Prices from 18-28 QAR. Torba Farmers Market will also take part this year, with a farm-to-fork dining concept that has a Harvest Menu offering appetisers, salads and mains including local chicken, slowbraised lamb, and pumpkin Kibbeh. Meal combos prided form 15-40QAR. They also have an organic market, and will also showcase local artisan businesses selling organic and gourmet food items. There will also be a mini zoo, daily fireworks (except opening night), and film screenings too!